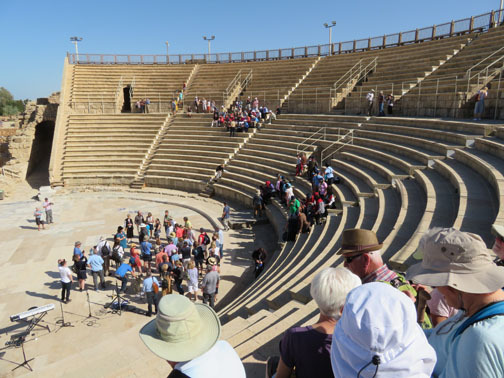 Located halfway between Tel Aviv and Haifa is the Caesarea National Park, the site of what remains of the ancient Roman city of Caesarea. 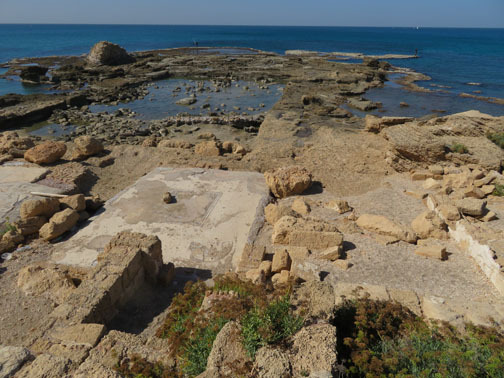 The city and harbor were built under Herod the Great c. 22–10 BC and later became the provincial capital of the Roman government of Palestine. The city was populated throughout the 1st to 6th centuries AD and became an important early center of Christianity during the Byzantine period when it flourished and its size extended. The city was mostly abandoned following the Muslim conquest of 640. It was re-fortified by the Crusaders, and finally destroyed by the Mamluks in 1265. The Park is on an area owned by the Rothschild Foundation, the only privately owned and managed property in Israel. This is what it looked like then. 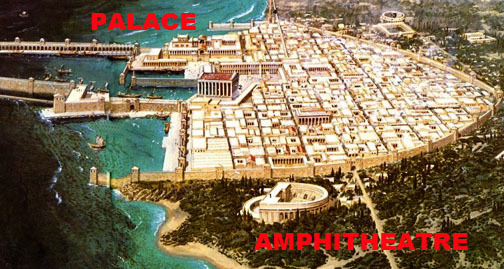 The city was important because it was a port where ships from all over the Mediterranean brought goods for trade. I found the restored amphitheatre and the remains of the palace foundation to be the most interesting areas. 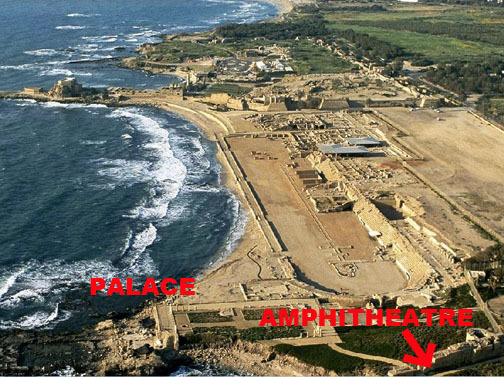 Notice in the photo above that there was a hippodrome located along the water’s edge. You can see the remnants of a pool that was part of the palace in this photo. 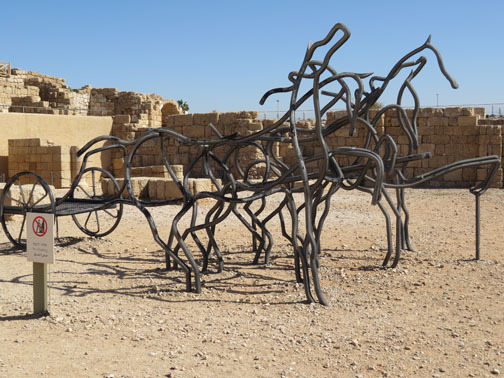 This modern sculpture of horses was located in the hippodrome. It actually did not look out of place! 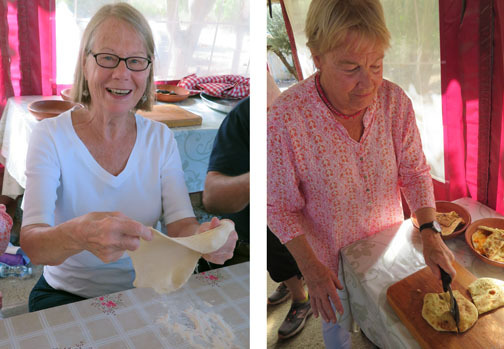 Next we visited the Yonay Olive Farm where we participated in making pita bread that was part of a delicious lunch. We then heard about the incredible family history that dates back three generations in Israel. 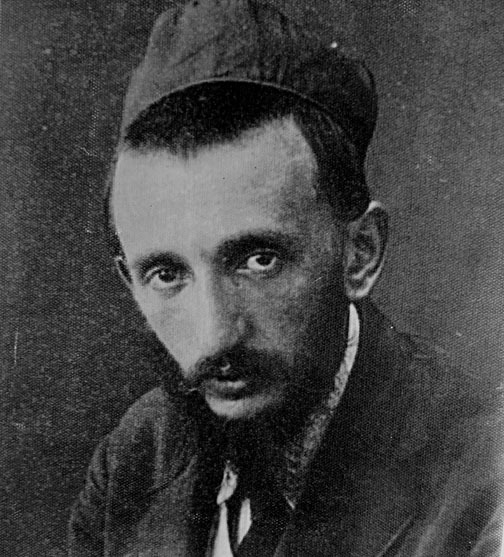 In 1925, a young Jewish religious leader, Yechezkel Taub, defied the head Rabbi of Warsaw by bringing a group of families to Israel to create a farming community. 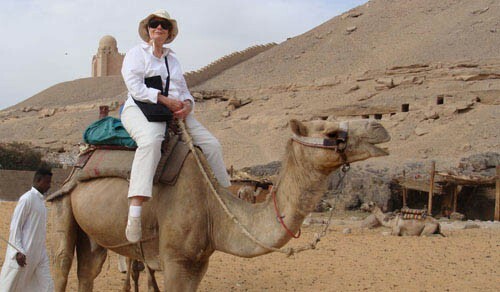 They lived close together for mutual protection from the Bedouins who camped nearby. They were aided by a Zionist group that sent construction workers to build a cow barn. One the construction workers, Mordecai Yonay, who was from Russia, married Yechezkel’s niece. Yechezkel established a rule that the villagers would help each other, but however they wanted to live was their business. Mordecai became the guard on Yechezkel’s farm and decided that the best way to deal with the Bedouins was to become friends with them, and he did. So much so, that he got to know them so well that he began to represent them in their disputes with the Israel Jews. He became an authority on bedouins. 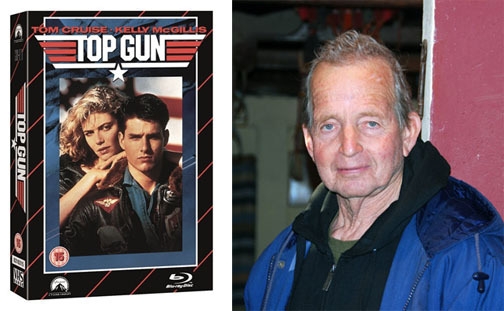 Mordecai’s son, Ehud, became a writer and moved to California where he wrote an article about fighter pilots and a book about the Israeli air force. The article led to the movie, Top Gun. Ehud returned to Israel to the farm his uncle established and devoted himself to making it a success. He died in 2012. 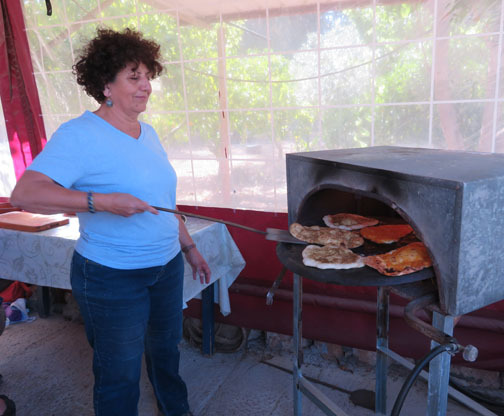 His widow, Shoshi, was our host for lunch. 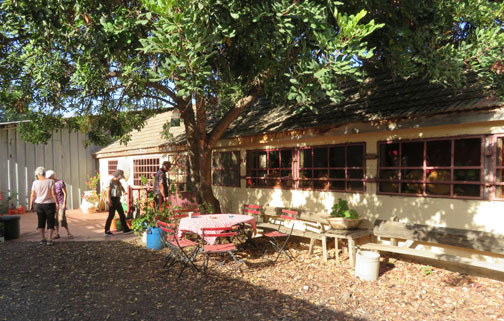 This is the former cow shed that is now is where Shoshi sells olive products, hosts lunches, and tells the story of her husband’s family. 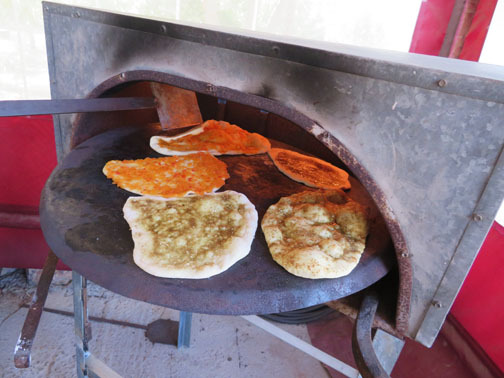 She had us make our own pita bread which she then baked in a very hot oven. 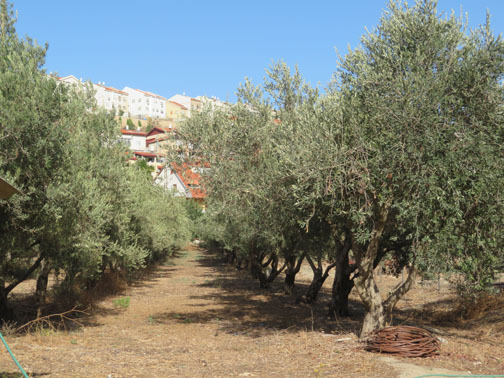 After lunch we visited the olive grows. 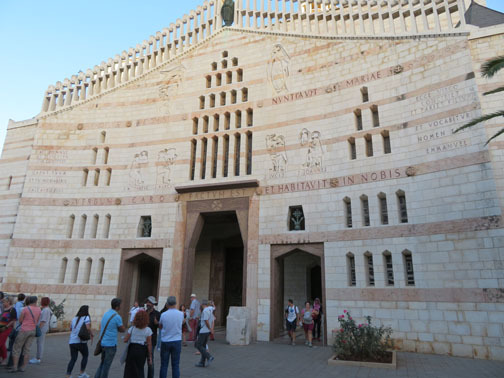 Our next stop was to Nazareth to visit the site where the Angel Gabriel tells Mary that she will be having a child who will be the son of God. Today Nazareth has a population of 56,000 of which 70% are Arab Muslims and 30% are Arab Christians. The site of the Annunciation is at the heart of the city surrounded by shops, offices, and lots of traffic. 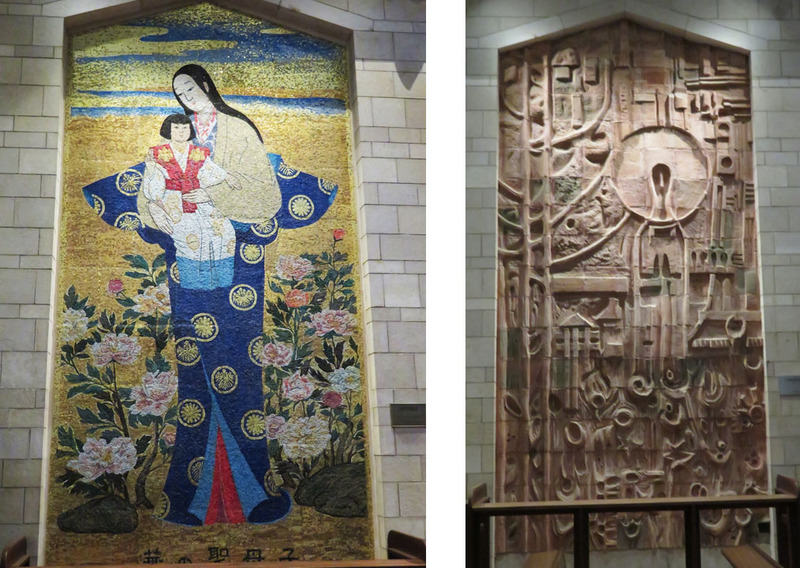 This is a 20th century church that was built after a number of earlier churches. 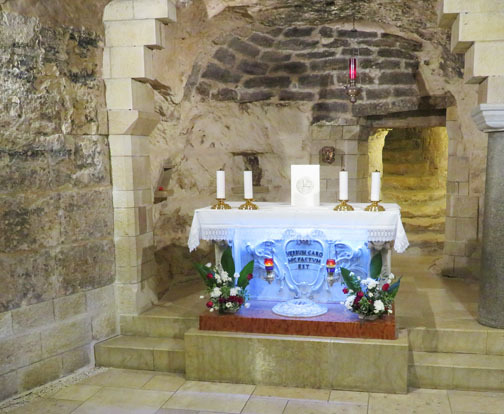 This is the “cave” where the Angel appeared to Mary. It is located on a lower level. On the upper level is a church. 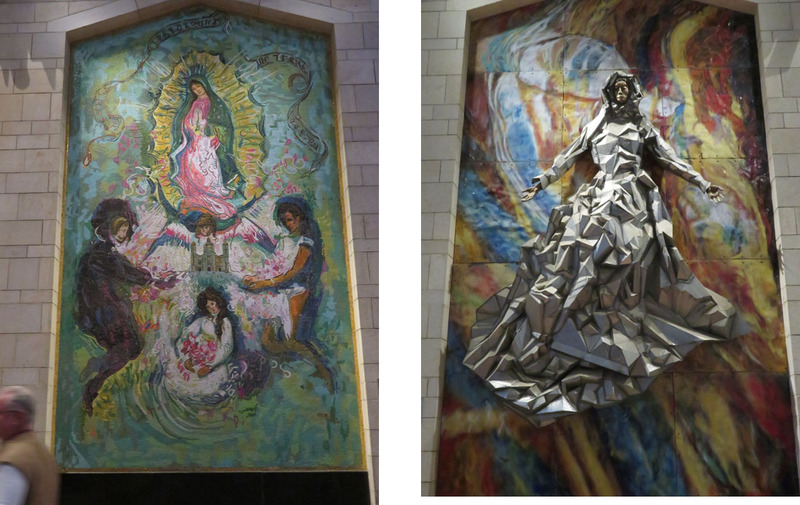 Both outside and inside are ceramic images of the Virgin by artists from countries all over the world. Each is uniquely different. I do not like the US Madonna. She looks mean and aggressive! This entry was posted in Israel on October 31, 2018 by JWH. are you planning on making that bread in Pawtucket too.